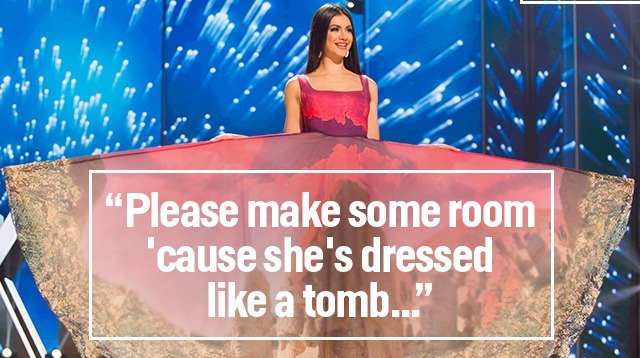 "Please make some room 'cause she's dressed like a tomb...it's Turkey"
The presentation of the 86 Miss Universe candidates in their national costumes didn't just get a lot of buzz because of the over-the-top outfits. Host Nick Teplitz's rhymes during the segment were witty and just plain funny! Here are some of the funniest of Teplitz's introductory spiels. Most of them rhyme and we don't think that's a crime. Like most diamond mines, she sparkles and shines...it's Angola! Get off her turf if you don't windsurf...Aruba! A coral reef inspired this costume's motif...Australia! The hills are alive, making this costume thrive...Austria! She's got a knack for rocking red, yellow, and black...it's Belgium! You know these wings are her favorite things...Belize! It's a thrill to be dressed like a mill...when you're Netherlands! This beauty queen likes to rep Halloweeen...Bulgaria! Covered in flowers, this dress empowers...Czech Republic! It's absurd not to dress like a bird...when you're Ecuador! Wearing a hat like a castle is never a hassle...when you're Germany! Everyone's a fan of her golden wingspan...Indonesia! Inspired by the notion of a multicolored ocean...Japan! This girl likes shoulders with spikes...it's Malaysia! Let's give her a hand 'cause she's inspired by sand...Namibia! You won't hear this rhyme so I won't waste my time...it's Philippines! You can just add a horse and there's your costume, of course...it's Sweden! Please make some room 'cause she's dressed like a tomb...it's Turkey! The finals are looming, but this beauty's blooming...it's Ukraine! Lifting this flower takes a lot of manpower...it's Uruguay! The costume's wide, but she wears it with pride...it's US Virgin Islands! In 1492, Columbus would have been less blue...if he had Venezeula!